"What is important to me is that it is a family restaurant for 60 years. Very Simple." And as I always love Walter and his son Cristoph who have owned the hotel and restaurant the last 3 generations, they introduced me to the new additions to the MICHELIN HOTEL 2018, "Thomas runs our 2nd restaurant which is very traditional and frisch and Renato directs the restaurant Schwarzwaelderhof which is connected to the hotel. The modern designs of Renato are part of a Portuguese heritage and since my wife is from Portugal I enjoy eating here now very much." jokes the very funny and serious Walter. He has 10 brothers and sisters and comes from that generation, however, Cristoph has a little baby coming and a 5 year old. "Yes the family continues..." he says dryly. The one thing that both the father and the son share is the dry sense of humor although Walter laughs a little puzzled when you laugh at his humor and his son only smiles. "My father is definitely the boss of the hotel and he wanders in and out of the restaurant all the time. He might say that I am the boss yet the real one is him. He comes to "work" let´s say about 3 to 4 times per week and tells me things to do. Now I try to do a little independent decisions on my own. It is much more fun for me now!" says Cristof. Walter? "I live in the hotel so I am here all the time. "he says dryly. "I live here. I know what's going on. It is very easy for me. 43 years, since I was little at the age of 7 I knew the restaurant. Now Cristoph is the boss." He says although his son, Cristoph loves his father so much he always says very gently" Naw, it is my father's passion, it is his life. It is all he has ever known and he is very much involved in the running of the hotel." " Yes but now I am older and I let Renato take care of introducing his modern presentations: food is visual and his is a little Portugal mixed with German." The cool dinner that I had that the chef Thomas, last night made especially to give to me. It is a traditional German dish basically kind of like pasta, yet baked. Yum. Okay I am trying to be on a diet yet with the very fattening food of Germany and just coming from the South of Italy! it is almost impossible to do. Maybe in the morning I shall hike the Black Forest about 25 kilometers and start to be trim and fit again! Anyway til that morning comes the food is great and the beer better. Farmer´s omelette which is the first item on my grandfather´s menu and of which the germans ate at least 20 a day is on that very traditional german menu. Here it is more modern. Yet here it is in Portugal everyday and I enjoy the new styles too." says the boss of the hotel. Cristoph asks me to interview the new director of the restaurant, Renato, and to ask Thomas to tell about the running of the second restaurant. When Walter joins us I say that he looks like the football player Messe. Renato starts laughing, "I know he does look like Messe" he keeps giggling as Walter says, "O that´s okay-I look like Messe? Take a picture of me and Christian Renaldo from Portugal." and he puts himself next to Renato. I say that my farmer family back in America would actually think that they were Messe and Renaldo since soccer isn´t so big in America. "He is as if family to me, Renato," says Walter seriously. "Some of the guests love him and the new modern approach and if they don´t I tell them to go to the other traditional restaurant right around the corner near the guest house. We have both. Modern and traditional. And sometimes guests say to get rid of the old man behind the counter, I am assuming that is me, yet I ignore those guests!" he says and Renato and me start laughing. "It is my hotel. It is my family. And it is my life. I have a great friendly hotel and restaurant. Renato does a great job." he says and I say that he is such a delight that there isn´t anybody who would say that they want to have him leave. He laughs, "O some do, some do." It is ALWAYS FUN TO INTERVIEW THAT FAMILY. Here is the Octopus and peas...love it. "While Renato tries the modern dishes and creates such items of interest such as the octopus and peas above that you have pictured, I am the more traditional person," says Thomas who is the also the cook at the restaurant Englers. "I thought it appropriate to have you try a traditional German dinner, one that is long in history such as the spatzen and the asparagus since it is in season and we only use the freshest vegetables. And a must is the German traditional beer, too." he says and after dinner we talked about Germany and Freiburg and he and his lovely waitress gave me another beer to take home with me! Let us just say that I drank way too much beer the last 4 days at Freiburg yet unfortunately when you come to Germany you tend to drink a lot of beer. And I haven´t even been to the beer Gardens of Munchen for Oktoberfest yet! The funniest conversation is when we started talking about Facebook and I asked which is the best contact, "How many facebook accounts do you have?" he asked and I said about 5! "See that is what I am talking about. I admire Mark Zuckerberg and all yet he says his facebook has 1 billion followers when in reality some people have 10 facebook accounts." Hmm I see the problem I said since all of my friends have multiple accounts and the average is about 3 to 6. OOPs:) Love it no matter how many it has! "It is the tastiest pizza in Freiburg, and everybody loves his pizza," says Nino about his brother Claudio's Sicilian inspired, "Yet very Roman" pizza. Claudio's brother, Nino owns the 1962 very beautiful and famous restaurant and hotel named, HOTEL RAPPEN on the Cathedral Square in Freiburg. "Okay, my story is that I lived in Italy 12 years and played professional handball, met my wife who also played professional handball although Italy doesn´t have such a competitive team as Germany. She was from Sicily and we moved to Messina Sicily a couple of years and actually my son, Bruce, is born in Italy." says Claudio. "My first chef here is from Sicily and my new pizzaolo, except for 2 weeks since I am making pizzas since he is on vacation, is from Italy. I didn´t want the same team that circulates around Freiburg making pizzas at my totally Italian restaurant since I wanted to create my own style, so I imported the Italians." he laughs. Yet supposedly everybody has said his pizza is the best! I shall have to taste test! Here is the heart shaped pizza that the cook made to give me last night! And although it is very beautiful I ate it since I am very hungry! Loved it pun intended! "Yes he thought to give you a special pizza yet I guess if everybody asks to have a heart shaped pizza we could do it." says Claudio. O and that one tasted great! "Yes, my family comes to eat pizza a lot, and Nino, who owns the restaurant Rappen and the hotel Rappen comes in here a couple of times a week. He loves my pizza. The wine store I started with my brother,Adriano, when I came back from Italy, and now I buy the wine from his store as does my brother. My brother, Sandros who runs the reception at the Rappen, honestly all of us brothers really don´t know what Sandros does with his time!" he laughs, "It is a great change for me since I have a degree in economics, and people say to me that they don´t expect a pizza restaurant owner to have a degree in economics, yet here I am. Although everything has to be perfect for me. The lights are architecturally designed, the beer garden is designer furniture, the bar designed with my instructions. It is my life and I want it to be cool. And yes the pizza is the best...my favorite is anything with mushrooms on it." 0049 0761 36 747 Schwarzer Kater at Bertholdstrasse 26. "The most difficult thing to do in running a bar and restaurant, at least in Freiburg, that I have found is that you have to keep the cooks!" jokes Christian. "Switzerland is very close and it pays better than Germany and the young people go to Switzerland. It is a struggle to keep the good ones and we try hard to do that. You can see that we have breakfast, lunch menus which carry the specials and the dinner. Some traditional German and some modern." "Alright here is the story. We have 4 people that own the Black Cat, one is my brother Hilmar who owns a bar in Karlsruhe, along with Hamme who owns all of the 4 places we have, and Adrian. 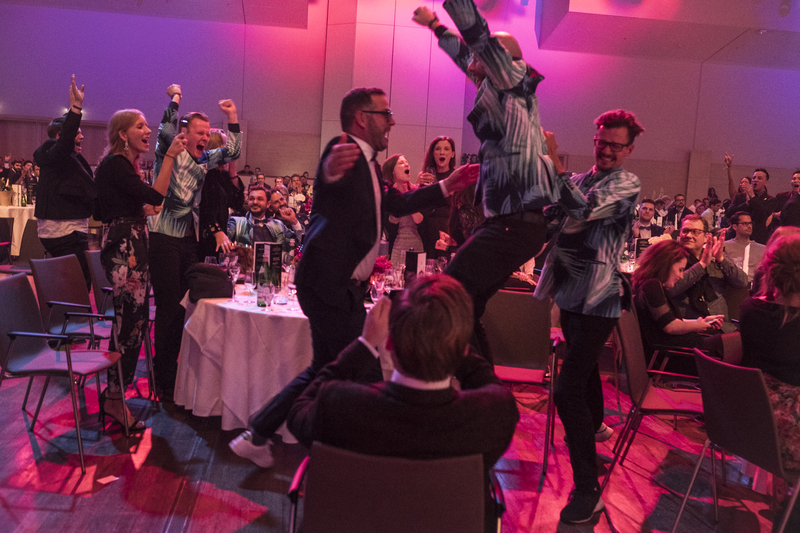 I have worked about 20 years in the industry and finally about a 1 year and 1/2 we talked about opening our own dream and found the location here which is perfect yet it wasn´t a restaurant bar it was only a cafe. We bought it and transformed the entire insides and outsides and today we celebrate the year long fight to put the sign of our choice showing the black cat on the building. The city said we couldn´t put a black cat because we couldn´t put animals on buildings and the process took many tries to finally have the right one." says Christian. However, I say it looks like a little ghost and that is cool since I love Casper the ghost. Yum and the best is the 4.00 euro pints! Having Freiburg beers at the Black(male)cat in the new 1 year old Schwarzer Kater aka the Black Male Cat. "Yes in America the Black Cat is the Black Cat, yet in German it has girl and boy innotations...funnily enough the name translates to the Black male cat! ps the german word, "die" translates to "the" in American language and the restaurant is "the coolest!" 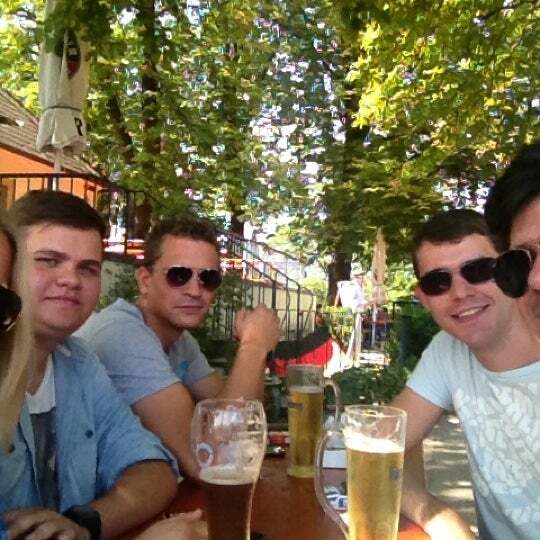 "The beer garden is very important to Germans and the culture and they always want to sit outside and have fun. 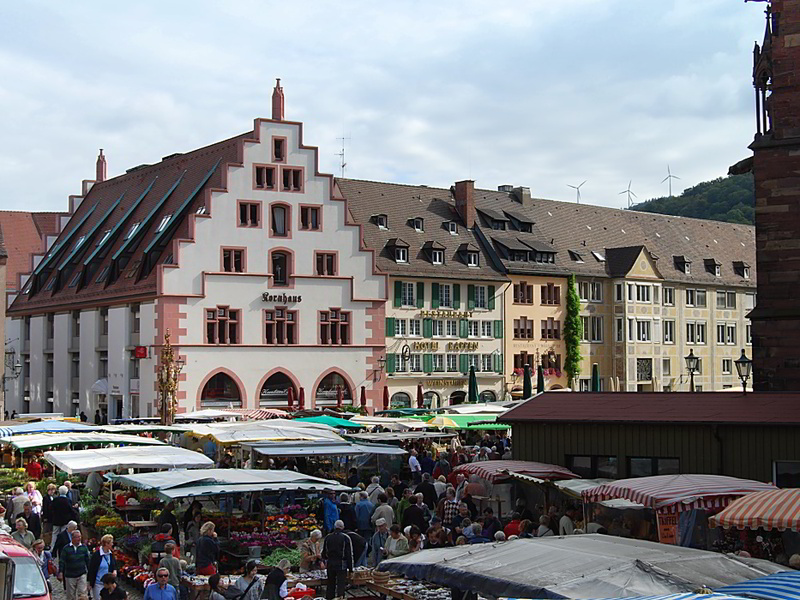 The tourists that I have met love to mingle with the German tables and it brings people together." "Right now we have about 12 beers, including of course German and England and Ireland. We hope to increase these beers, mostly since we love to drink beer!" 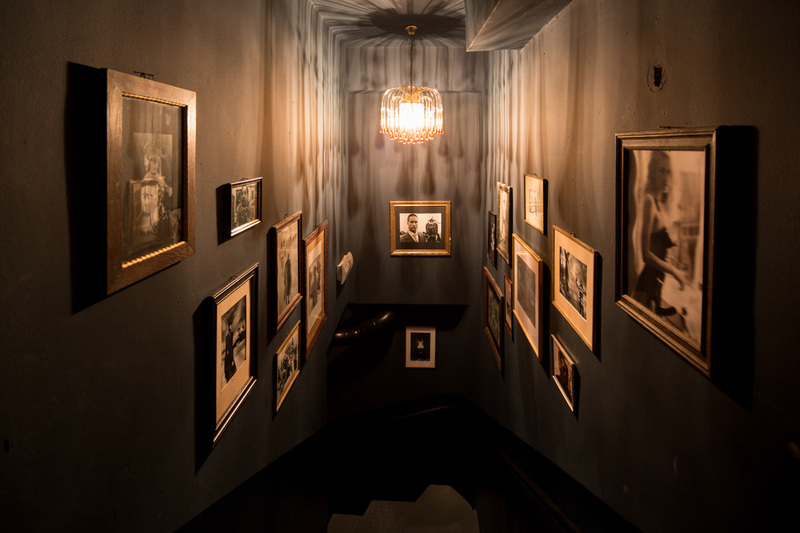 "Upstairs is a theme saloon type where we found some cool American Signs at German Auction Houses and bought these!" says Christian. I LOVE IT since it looks like a perfectly made Walt Disney Themed store! 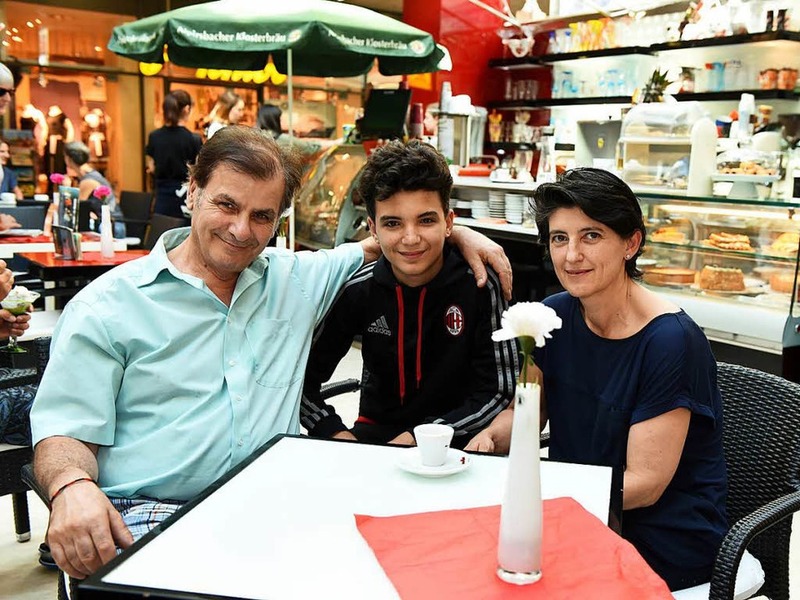 The family of Nino, his 3 brothers, Claudio pictured above, Sandros, who is receptionist at the hotel Rappen, and Adriano who owns a cool totally Italian pasta,wine store and cookies make up the funky all inclusive Freiburg culinary fare! The Hotel RAPPEN is beautifully located with a fantastic view of the Cathedral. "Germans love Beer Gardens and as soon as the weather starts to get good, they always want to sit outside and drink beer. The tourists just want to look at the Cathedral." says Nino. "If you see the rooms you will notice they are modern and me and my wife wanted that look. We have one piece of candy on each bed to welcome you and if you come when the florists are in the square maybe you can be lucky and have fresh flowers in the room. Although honestly, the markets in the square bother me since my guests love to sit outside and it gets crowded." Enjoy the view of the Cathedral in the Square, or buy some fruit at the markets! Cool modern rooms of the hotel seeing the Cathedral in the square. Mine has a view of the Cathedral and it was much fun to watch the people in the square during the day, but much funner to watch them running under umbrellas in the rain! Light and Modern and very comfortable is the Rappen. The young Capo, Nino and his wife at the lovely restaurant, The RAPPEN. "She likes to decorate the room with flowers, yet it is my baby, the restaurant and Rappen and she tells me that all the time. It is your project! she reminds me when I tell her of a stressful time!" "My family´s story is that my father has Italian heritage and my mother is German heritage. If you notice the menu it is German with Italian touches. It is very good and although I went to school for culinary cooking and learned the craft many years I prefer not to be a cook in my own kitchen. I sometimes cook at home for my wife, though to keep in practice. When I bought the restaurant and hotel I wanted it to be a very good restaurant and since it is very big, I didn´t want to mess up the cooking!" says Nino. "Sandros is my brother , he is the receptionist at the hotel which is right above the restaurant. He is a handball professional, too. The entire family plays handball.Sometimes my mom comes in to eat and does my dad, but they only come to eat, not to work in the restaurant. My dad has a great gold business." says Nino. Claudio said that his father had a gold business and that he worked for him before opening the pizza restaurant, yet his father started having too much e-commerce business and he wanted a couple days to have fun, so he told Claudio to open a pizza restaurant instead. "You know family." he says. O yes I do that is the way mine is to, I say. Sandros says, "O I see you made it through the night!" as I check out today and say how much I love the flowers in the windows. "We have a special agreement with the florists in the square and sometimes they come and have breakfasts and we receive these fresh roses. We love it." I met Lena, who is Adriano´s girlfriend, at the specialty "totally 100% wine speciatly store and the products come from Italy since Adriano´s mother is Italian and his father is German." she says as we chat at the store drinking the Prosecco waiting for Adriano to arrive. "Here let me show you the cookies that we have imported, honestly every week me and Adriano drive to Bolzano to pick up the Italian specialty items. The wine we choose from vineyards in Italy and we went to the Venuto Wine store 2 days this year since 4 days was too much. We drank a lot of wine, maybe 50 glasses. That is very fun to do, and you can see the specialty Italian products have the German lettering on these since it is northern Italian." she says as she shows me the cool items. I love the little baby in the red wine truck! 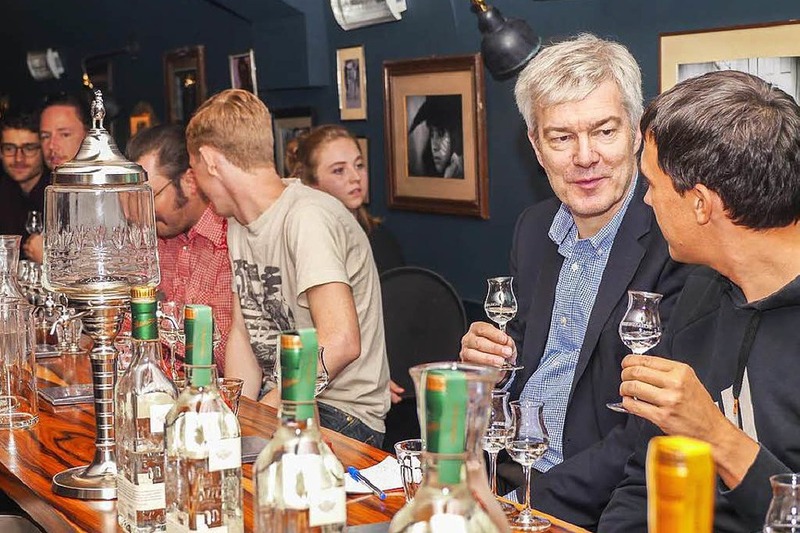 "We have tons of specialty Grappa which has many flavors and while it is strong, 41%, it is a little too strong to drink at least in my opinion. I know people love to have a little glass of Grappa when they eat dinner, and we carry many Grappas. The selection of wine is from say 8.00 euros to at the highest 100.00 euros since the we can´t afford the highest price wine here. 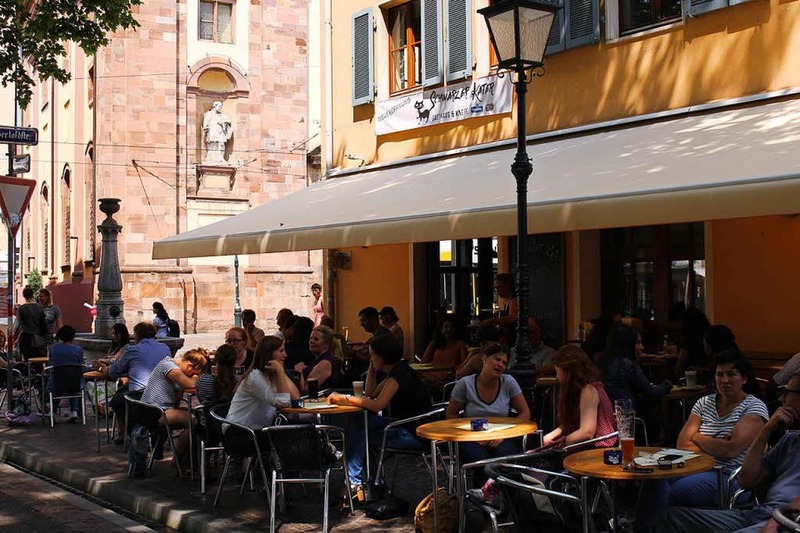 The people of Freiburg know us and they come in to drink a espresso or a prosecco in the store, yet if they buy a bottle of wine they have to drink it outside." A must to try a little special German and Italian product located at Karlstrasse 5 Freiburg. Adriano finally arrives, "O I am happy you found us!" he says and a couple of people come in and take Prosecco. "You need to try the best it is the dryest." he says and starts to give me another! Prosecco, yet Lena tells him I have that finest one. "Alright, I wanted to be sure you tasted the dry one. We are starting to bring more and more wines into the store and I hope to have a big selection soon. I have my two biggest clients both my brothers!" he says laughing. It is a cave bar, underground, with another level under it that is breathtakingly beautiful. I loved it immediately and couldn´t wait to interview the bartenders the first night before running down more stairs to see it. Gorgeous, elegant and lovely with cocktails that are strong and special and spiritual. Metra, the bartender is delightful, all sweetness and bubbly, "You have to meet the owners they would love you and the website. 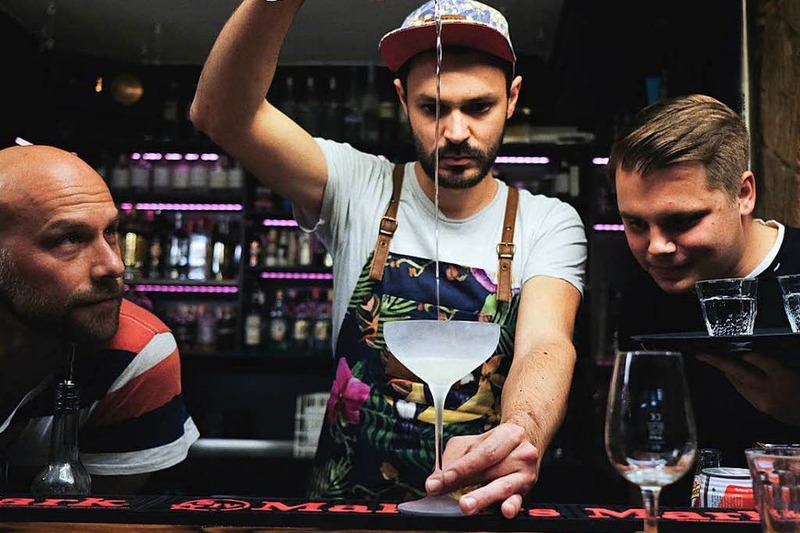 They´re totally cool and a local person makes our spirits that we use in the signature drinks." she says as she shows me the menu. 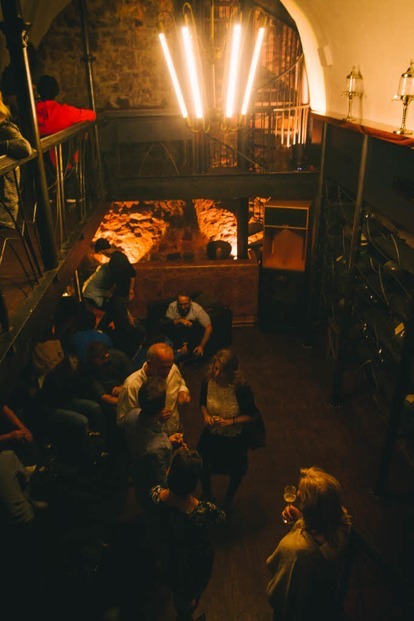 Walk down a hidden archway alley, down stone cave steps to the cool cave inside and find the elegant One Trick Pony bar...while some students complained about the high prices, the atmosphere is worth it. 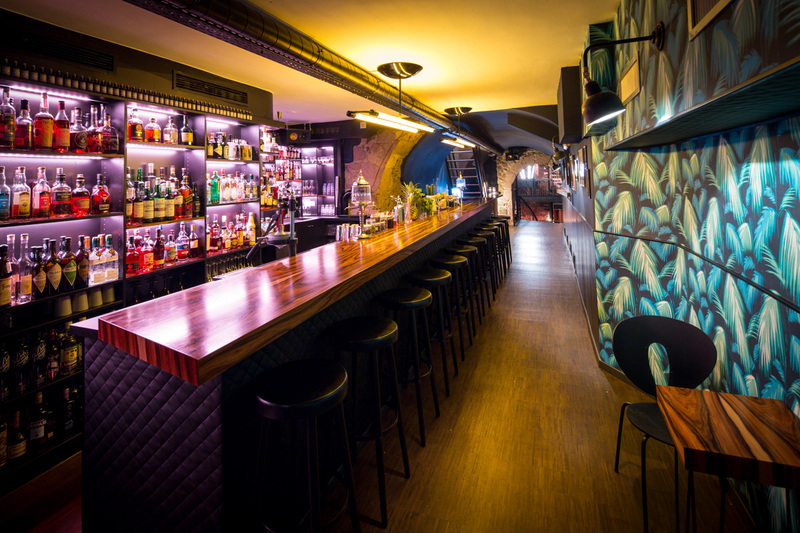 "The two owners wanted to design the bar and the space themselves and everybody is amazed when they walk in the first time. They do what you do, walk past the bar and into the lower cave. They always ask, O is a third level upstairs? Yet we have iron staircases that are used only in fire escape emergencies, it is a law and at least they made them look cool! Everybody asks about these and they love to sit on the first balcony and see the folks downstairs, yet on the weekends people are standing on the balcony, standing at the bar, standing downstairs!" says Metra. Does she love when it is full of people or a little quieter? "People." Andy above says that the bar turns away people on the weekends, "We have a limit of 200 people maximum and we have to turn people away. 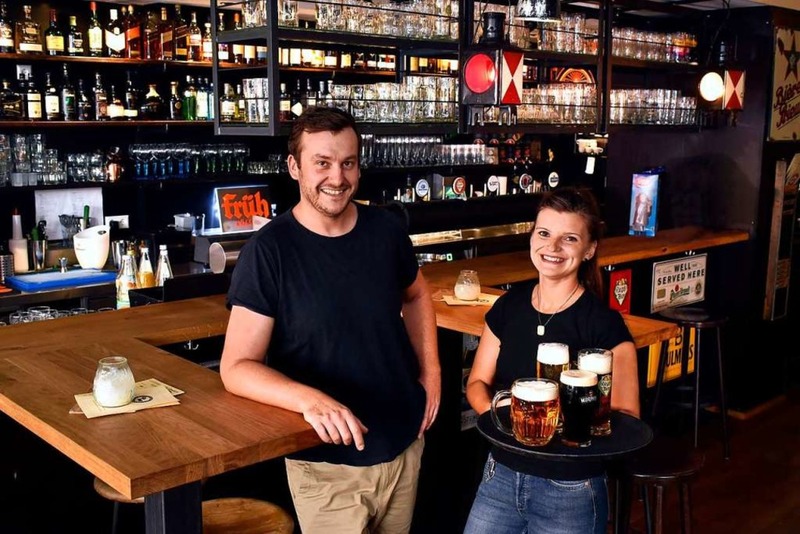 I´m not sure if more tourists coming in is a good idea since it is a fun cool bar for the Freiburg people. 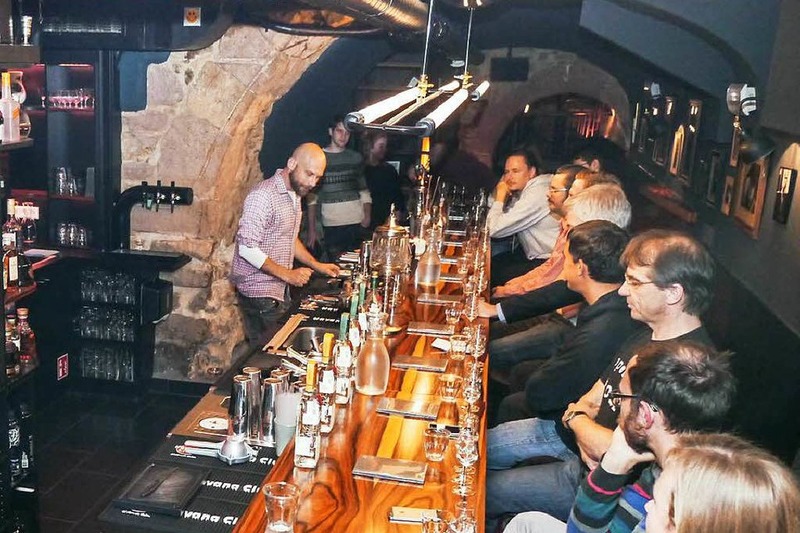 I know it is a little expensive for cocktails, yet the liquour is premium and the atmosphere the best." My favorite friend in Friedburg, the owner of the Schwarzwaelder Hof, Walter, introduced me to his favorite gelato place owned by his friends, Luigi and Anna. 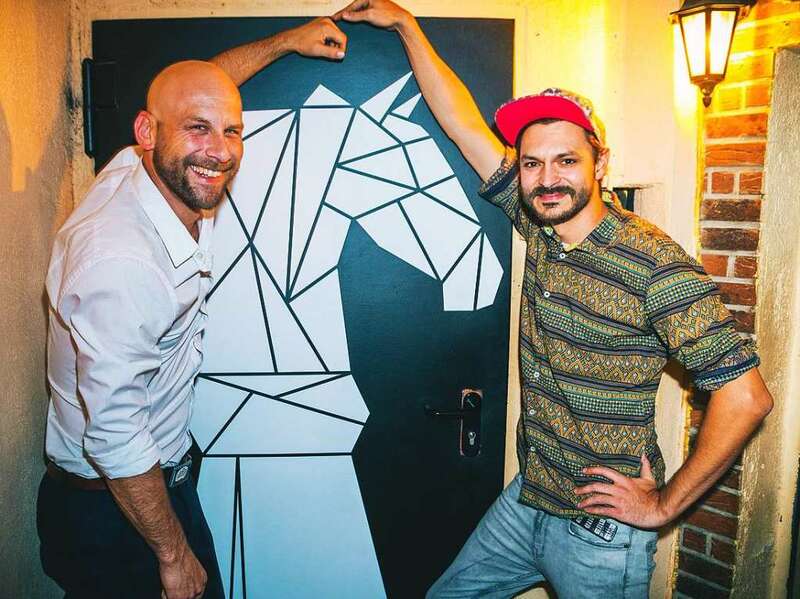 You can find EisCafe https://www.eiscafe-quovadis.de/ right next to the One Trick Pony, so have your gelato and head down for drinks! Love the Gelatos, "My son plays the football, you can see him and the sports stars on the wall," says Luigi and I ask if I can photograph these. The little garden is cool in the back, a upstairs is lovely, and cozy. Yum. O hey everybody loves Gelatos, right`and you can try a variety of cool desserts too. Familys line up here! When you ask the students at the many universities what they love most about Freiburg..."The cool Internet Cafe on Friedrichring since it has cheap modern internet with Western Union so my mom and dad can keep in touch!" they say laughing. I am not sure if mom and dad are laughing, yet the students love it. I used to feel left out because everybody with Iphones and Motos and Apples and Samsung had the windows broke! So, finally one day my little window on my phone needed fixing! I have the coolest phone in the world, yet it needs a little phone docter and here you can fix that too! Professional copy services, gorgeous leather chairs of my favorite Black and Red, and tons of cool phone colors, plus all the adapters, accessories for your cool IPHONE to call home with! Nice owner named Hasan has one of the most modern professional centers I have seen in Europe and knows about the industry. Cool Apple and Samsung newest covers love it. A business traveler from another country can´t use his sim card? No problem, Hasan has sim cards for every country of use and international too. "We have iphone 7 and all the new models of the Samsung Phones and of course we can find one you want. The latest headphones and mouse and keyboards too, it is a very high tech fun store. I hope the tourists love it and I hope the students do too."